See video of the weekend. The Gordano club hope to arrive on Friday afternoon 19th April and depart midday Sunday 21st April. Timing depends on tide and weather conditions. Operation will be from 2 stations on HF 80 - 10 metres. GB5IMD will be used during the stay on the island. Unfortunately G8SPC Bob was not be able to join. 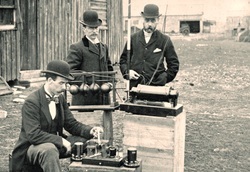 was a Cardiff based Post Office engineer) transmitted and received the first wireless signals over open sea between Lavernock Point and Flat Holm island. CLEAR". The morse recording slip for the first message is on display in the National Museum of Wales.